Hackensack, New Jersey. The Bergen County Bank. Circa 1855-1857. Face Plate and Face Tint Plate for a 4-Subject Sheet. $1-$2-$3-$5.Circa 1855-1857. Face plate and face tint plate for a 4-subject sheet. $1-$2-$3-$5. Haxby NJ-170, G2-G4-G6-G8. Engraved date November 26, 1855. Steel. 9 x 14 inches. Imprint of Danforth, Wright and Company, New York and Philadelphia. The face plate is light pewter gray, satiny and bright. Typical hairlines are seen from old cleaning of the plate in preparation for printing, but otherwise handling marks are few and minor in nature. A couple of tiny oxidation spots are seen, but these are confined to the margins and thus do not affect the design of any note on the sheet. Some very light golden brown toning is seen in places. Deeply engraved and beautifully vignetted, this plate is truly an aesthetic delight. Historically important as a record in steel of all the legitimate currency designs issued by the bank. The $1, $3 and $5 are priced in Haxby, but the $2 denomination is listed as SENC. The tint plate is similarly well preserved, and shows a little wax buildup. On this plate, a few minuscule oxidation marks are seen, but these are at the very edges, again not affecting the sheet design. 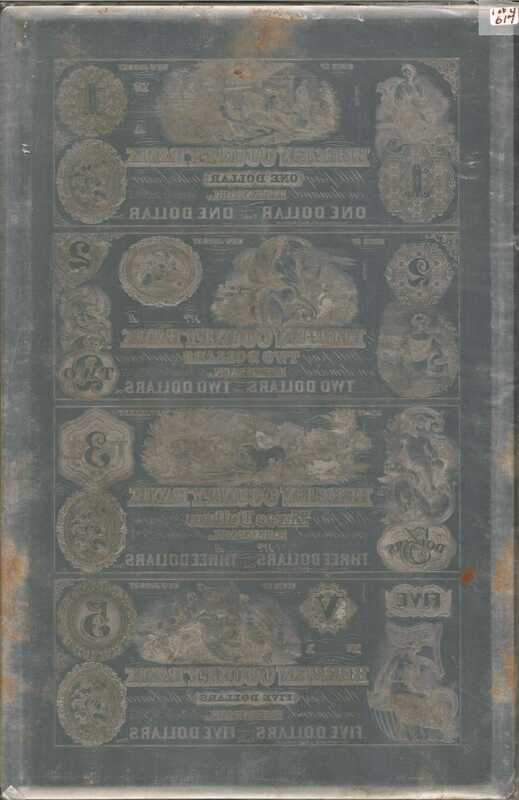 Neither the descriptions in Haxby, nor the illustrations of the known denominations confirm the use of this tint plate for the notes of the Bergen County Bank, but this name is engraved in the top margin above the ONE tint confirming the original intent. Both plates are with their original paper wrappers, hand labeled as to bank, denomination and type of plate. The wrappers are both intact. A superb pair of plates. (Total: 2 pieces)pMark of J. Keim, Philadelphia on back of each plate. The Bergen County Bank was a smallish institution in northern New Jersey. In 1857 its capital was a modest $50,000. Louis Becker was president, and C.D. Taylor was cashier.